The machine is with 10 station hydraulic turret. 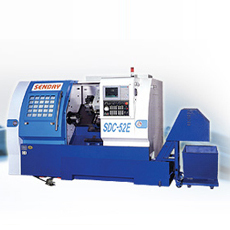 The index time is 0.3sec and with high repeatability accuracy. The spindle is 100 mm big diameter high accuracy angular and NN type bearings. 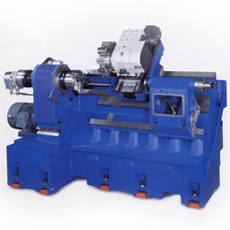 Which are suitable for precision cutting with high speed and heavy cutting with low speed. Manual type programmable tailstock. Easy operation. Handle tractor with interlock device for fixing seat. Easy positioning and movement. Advanced and high-performance PC Based 900M Controller. Simplified programming allows inexperienced operators to get up & running with minimal training. Equipped with 10.4” color TFT display and MPG simulation easily to trace tools path and graphic display. Simplified & power electricity separated configuration provide reliable and safe feature easy maintenance. Wide range high torque spindle motor. Tailstock with manual type programmable. Front-set and movable coolant tank + chip conveyor. One-piece bed and base structure. Box way structure especially for heavy duty turning.